So, you’ve heard the whispers, you saw the newspaper announcement, you’ve seen the colour flyers all around the neighbourhood. But, you ask yourself, what this Creative Café all about? 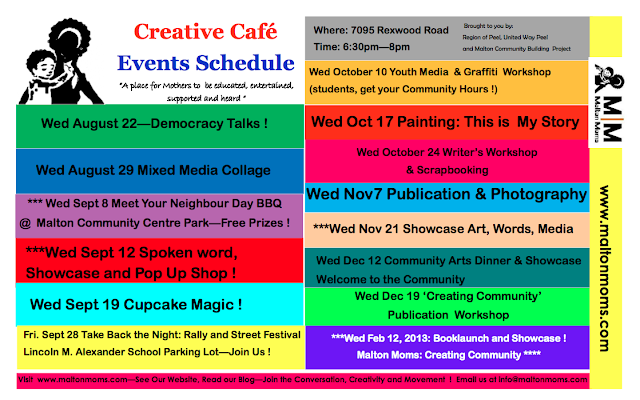 The Malton Moms Creative Café is a one year project funded by the United Way of Peel Region, the Region of Peel and supported by the Malton Community Building Project to engage mothers, create community and to document the creative activities and lives of mothers who live in Malton. Recent workshop presenters have been Belinda Ageda from Beesworks Studios www.belinda-ageda.blogspot.ca and www.beesworksstudios.blogspot.ca, Bee Quammie from www.83toinfinity.com, Poet Isis Oya www.crystalmark.blogspot.com and Legendary Scrapbooker Nadine Rubie Foster and Photographer Roseanne Bailey. Malton Moms currently has a web following of 120 users. The in-person workshops, meet twice monthly –a creative activity: story writing, poetry, discussions about activism, t-shirt making, painting, scrapbooking, performance and so much more, which they will be capturing in their soon to be published book, Creating Community. Here, the Malton Moms share the story of how they built a strong, cohesive women’s community group, through the meeting of two, at the time, pregnant mothers, and a desire to build connection and capacity in their neighbourhood. The book, to be released in the Spring of 2013, will highlight the stories, pictures and art of all the participants who attend the Creative Café Series. All Malton mothers are welcome to attend. The Moms also meet once a month to hold an Executive Meeting. Most recently, Malton Moms has been filmed for the Tantrum Creative film, Malton:United which will be shown to the public on June 13th through the Malton Community Building Project. So how do I join, you ask yourself? : Email or come out to one of the dates posted below. 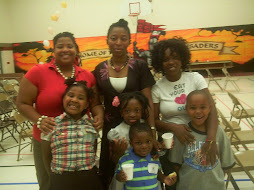 Malton Moms are making moves, Malton Moms are making change. Join the Moms on Facebook or check out one of the dates below to join. There is always childminding, and refreshments. Come in and Create Community with the Malton Moms.